Want to beautify your hair before the start of 2016?! I’ve got just the treat for you! 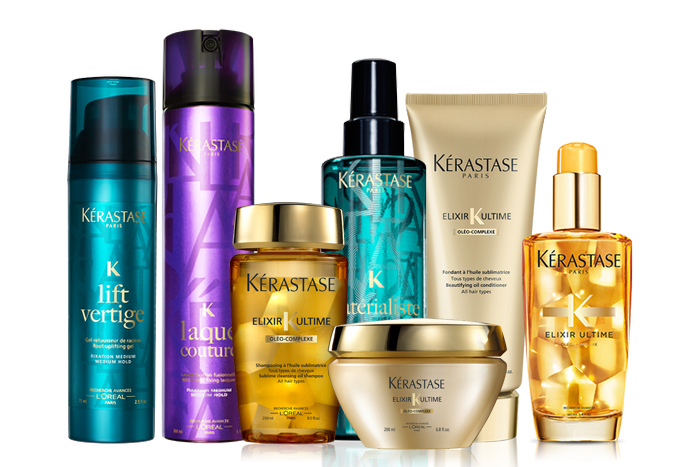 I was recently introduced to the Kérastase Résistance Collection dedicated to treating weak and damaged hair. Kérastase Résistance rebuilds the internal substance of hair often affected by chemical or mechanical substances to restore its strength and health. Force architect products is dedicated for damaged hair (erosion level 1-2) while Therapiste products (erosion level 3-4) is designed for very damaged and over processed hair. After use of these products, hair is restored and quality of the fiber is like new. 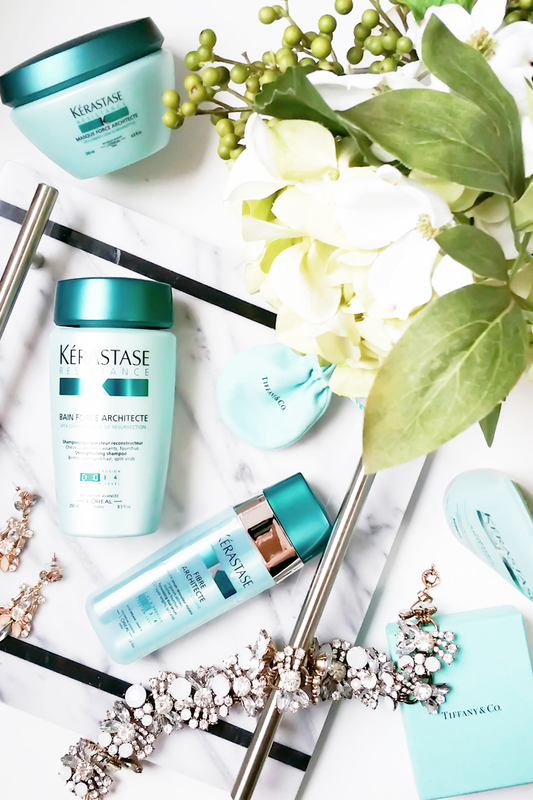 I recently started incorporating the Kérastase Résistance into my daily hair routine, including the use of BAIN FORCE ARCHITECTE shampoo, CIMENT ANTI-USURE as a treatment and SÉRUM FIBRE ARCHITECTE as a texturizer – the perfect simple 3 step process. If the Kérastase Résistance is not suitable for you, there is a wide range of other Kérastase collections that addresses any hair concern. I’m excited to partner with Kérastase to offer one lucky winner the chance to win a variety hair prize pack loaded with amazing hair products valued at over $300! Keep reading to enter the giveaway! I’ll be drawing a winner on Christmas Day! Here is how you can win, enter the draw by using the WIDGET below. Contest is open from December 18, 2015 12:00 a.m. EST to December 25, 2015 12:00 a.m. EST. This contest is opened to Canadian Residents only, one winner will be selected at random. Winner must provide a valid Canadian address along with contact information to receive this prize pack! Good Luck! +5 entries by commenting and sharing your hair concerns! My hair is very dry and quite brittle. I find the older I get the drier my hair gets. My biggest concern is dryness. I am also concerned about frizz and would love to have more shine to my hair. My biggest hair concern is dryness, but volume and damage are a close second and third! Thanks. I have terrible split ends. My hair concerns area always Dr, frizzy hair and split ends!! Winter tends to make my hair drier and frizzier. For me my hair concerns are ageing as well and damage done by hair colouring. We get cold weather in town as well so damage from it to! My hair is very thick and doesn’t hold a style very well. My hair is really dry and rough. My hair gets quite dry and brittle and breaks easily. My hair is really fine and thin, and in the winter it gets super static, but since it’s so fine it’s hard to find a good hair oil that doesn’t make it limp. My hair is very fine and oily. Ugh where do I start with my hair concerns, I have greasy roots, but super dry end. I colour my hair so I want something that will clean my hair, protect my colour and save my end! My hair concerns are dryness and brittleness. My hair concern is frizzy hair! Kerastase has so many products for unique hair issues! I have super curly hair and it gets frizzy from time to time – not to mention the split ends! My hair is dry and prone to split ends! My hair is very dull. Right now my hair is so dry and static all the time! I’m growing it long so that’s a nuisance. My hair is really flyaway! My hair is very dry and damaged. Thanks for the chance to win these amazing products! I fry my hair. I always turn my hair curlers onto the highest temperature available. My hair is proof that this is an extremly bad thing to do. main concern is dryness. I’ve had my hair chemically straightened twice over the last 4 years so breakage is also evident! cheers! Happy Holidays! My biggest issue is dry frizzy hair. Thanks for the giveaway. My hair concerns includes dryness and lack of volume. my hair concerns are dry and brittle along with frizz.i have thin hair that has increasingly become drier and more brittle and frizzy. My hair is always dry and frizzy! Eek! My hair gets frizzy .. I’m sure greying isn’t helping but it feels dried out most times. Trying to look stylish while growing it out lol. Ponytail is my life right now!